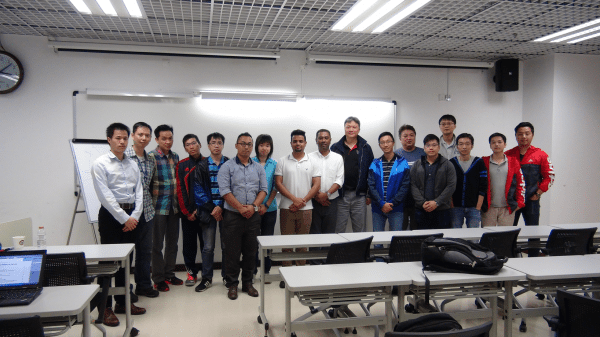 On 26-28 April 2017, the University sponsored the APNIC (Asia Pacific Network Information Centre) on Internet Resource Management and IPv6 Deployment workshop on campus. Members of Macao’s community including universities and government departments were invited to join. APNIC is an organization dedicated to sustaining a global, open, stable, and secure Internet that serves the Asia Pacific region. APNIC works primarily as the Regional Internet address Registry (or RIR) for the Asia Pacific, with responsibility for distribution and management of IP addresses, and for registry services including “whois”, resource certification, and reverse DNS. As an RIR, APNIC facilitates bottom up, community-based development of Internet resource policies, which determine how IP addresses and related resources are managed. The University of Macau is a member of APNIC. The workshop is open for world-wide registration. There are attendees from China, Nepal and Australia. Four colleagues from ICTO and AMSV joined the workshop. The University offered complimentary seats to other sister higher education institutions/ universities likes MUST, MPI, CityU, IFT and also the Government department CTT. During the workshop, the speaker of APNIC introduced the concept of IPv6 protocol architecture, addressing structure, design issues when planning for IPv6 deployment focusing on IP core network. He also discussed network infrastructure design principles for dual stack deployment, OSPFv3, MP-BGP and transition technologies etc. Whenever there is a chance, ICTO will bring in more advanced IT workshops to the University as well as the Macao community. Special thanks to Prof. Ken Tam and Mr. Bryan Tou of FST for their kind assistance and support on this workshop.